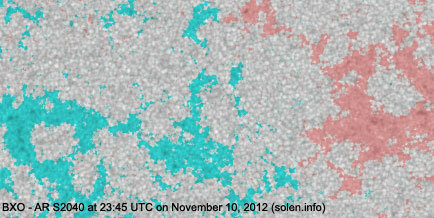 Last major update issued on November 12, 2012 at 05:30 UTC. 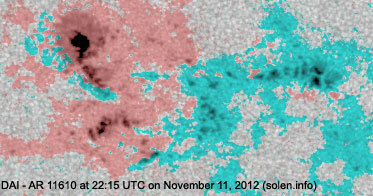 The geomagnetic field was very quiet on November 11. 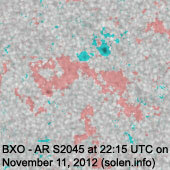 Solar wind speed at SOHO ranged between 270 and 342 km/s. 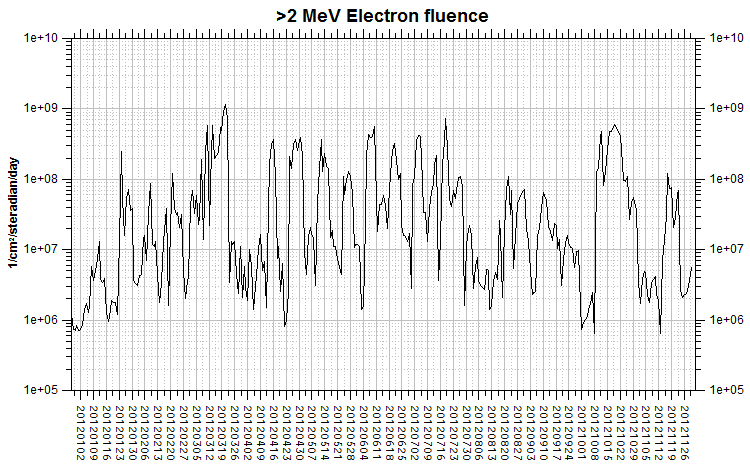 Solar flux measured at 20h UTC on 2.8 GHz was 133.3 (decreasing 3.5 over the last solar rotation). 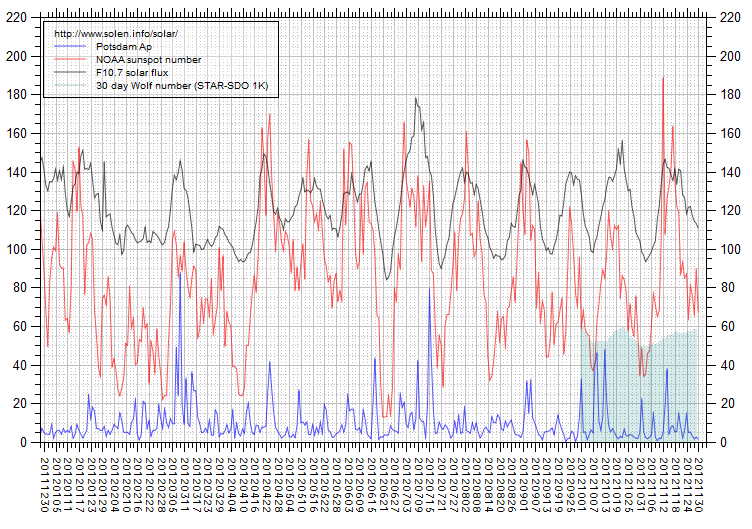 The Potsdam WDC planetary A index was 2 (STAR Ap - based on the mean of three hour interval ap indices: 2.5). 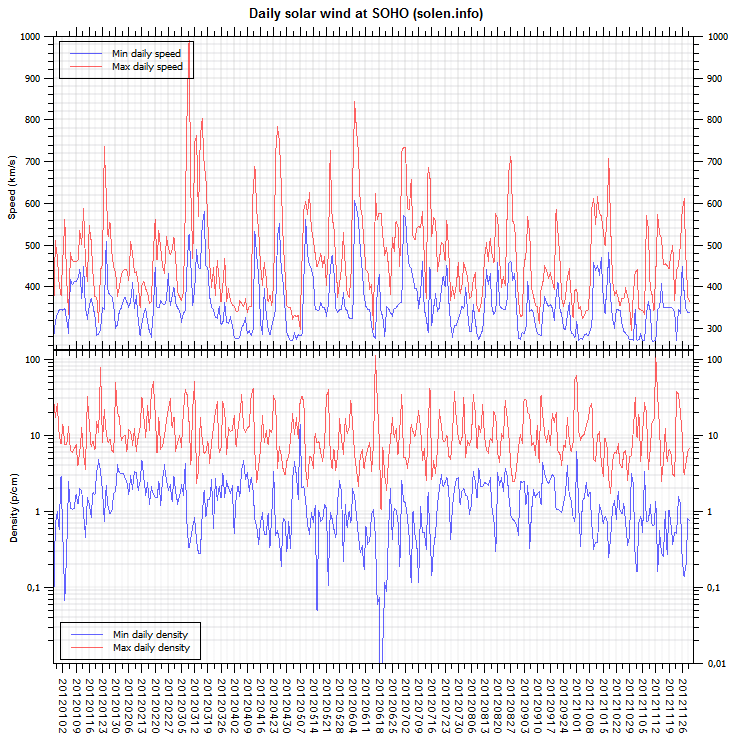 Three hour interval K indices: 11001100 (planetary), 11012211 (Boulder). 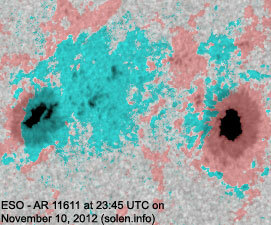 Region 11609 [S16E05] was quiet and stable. 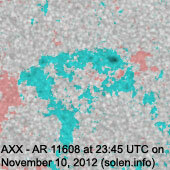 Region 11610 [S23E06] developed slowly and was mostly quiet. 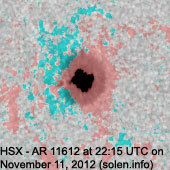 Region 11611 [N12E27] was quiet and stable. 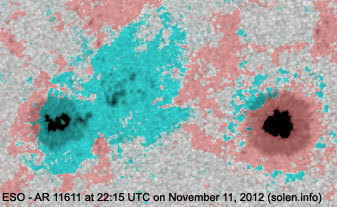 Region 11612 [N07E37] was quiet and stable. 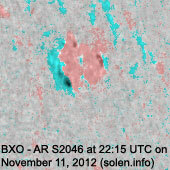 New region 11613 [S23E59] rotated into view on November 9 and got its NOAA number 2 days later. 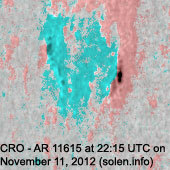 New region 11614 [N14E72] rotated into view on November 10 and was numbered by SWPC the next day. 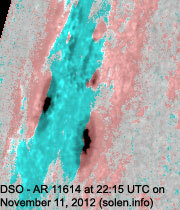 New region 11615 [N09E62] emerged near the northeast limb. 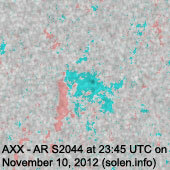 S2040 [N14W08] was quiet and stable. 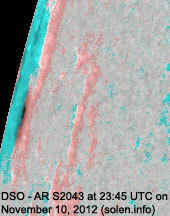 New region S2045 [S15E20] emerged with several tiny spots. 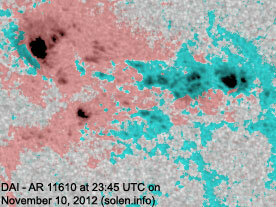 New region S2046 [N15W63] emerged with several spots. 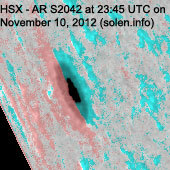 November 9: A partial halo CME was observed after a filament eruption in the southern hemisphere, the CME could reach Earth late on November 12 or on November 13. 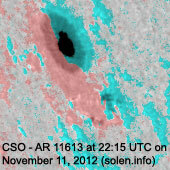 November 10: A small CME, possibly with a weak Earth directed component, was observed following a filament eruption near AR 11608 starting at approx. 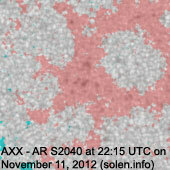 05h UTC. 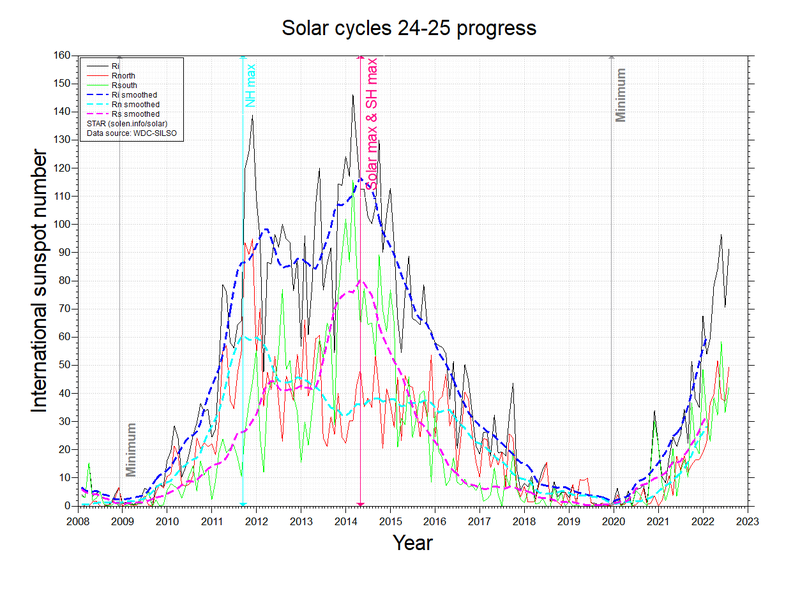 November 11: No obviously Earth directed CMEs were observed in LASCO and STEREO imagery. 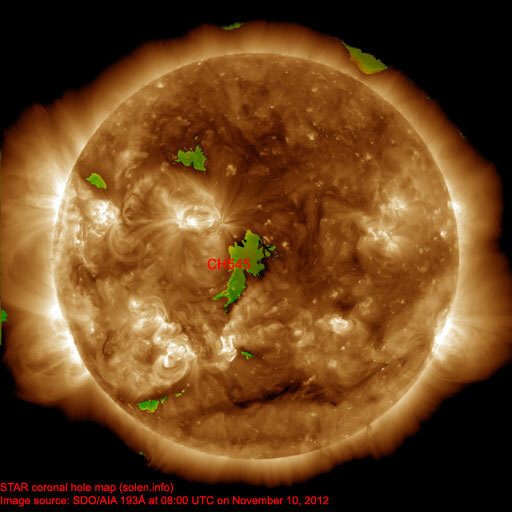 A trans equatorial coronal hole (CH545) was in an Earth facing position on November 10. The geomagnetic field is expected to be mostly quiet on November 12. 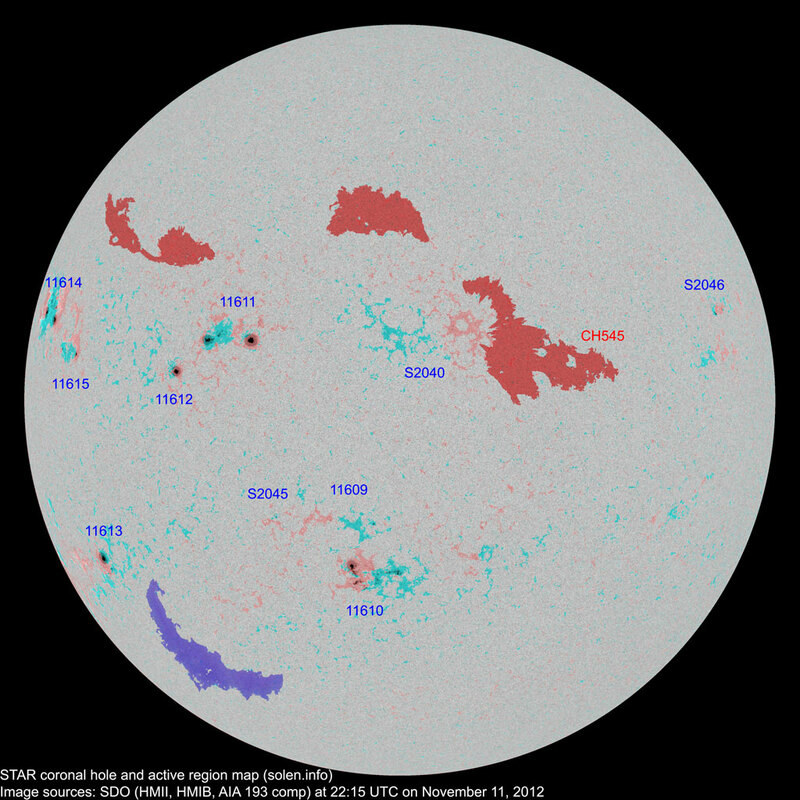 From late on Nov.12 and on Nov.13 there is a chance the CME observed on Nov.9 will arrive and cause unsettled to minor storm conditions. 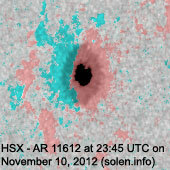 The CME could arrive just before a high speed stream from CH545. 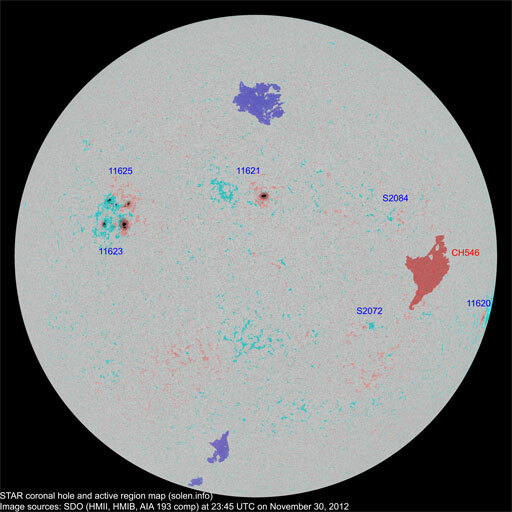 The CME observed on Nov.10 could arrive on Nov.13 but may not be noticable as it was small and there will likely be more significant disturbances in progress.